Grower Interview: bluemax |Sundews Etc. This is part of a series of conversations with other growers about their experiences growing carnivorous plants. It's always useful to see how someone else does things! The full series can be read here, or by grower at the Series page. 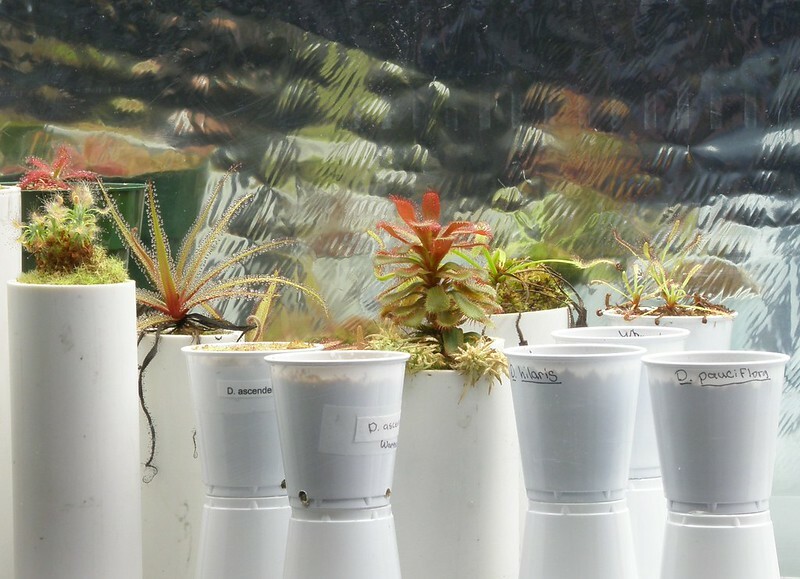 I first encountered bluemax posting about petiolaris sundews on Terra Forums some months ago, and he kindly agreed to sit down with me on IRC for the first in the Grower Interview series of posts. He chose to be referred to in this interview as "bluemax," which is the name under which he is active in CP communities on the internet. We chatted last night, and he very kindly also shared a few photos of his collection. Enjoy. Sundews Etc. So, thanks for agreeing to chat about plants for the blog. bluemax Sure. I'm looking forward to it. I can always chat about growing cps. 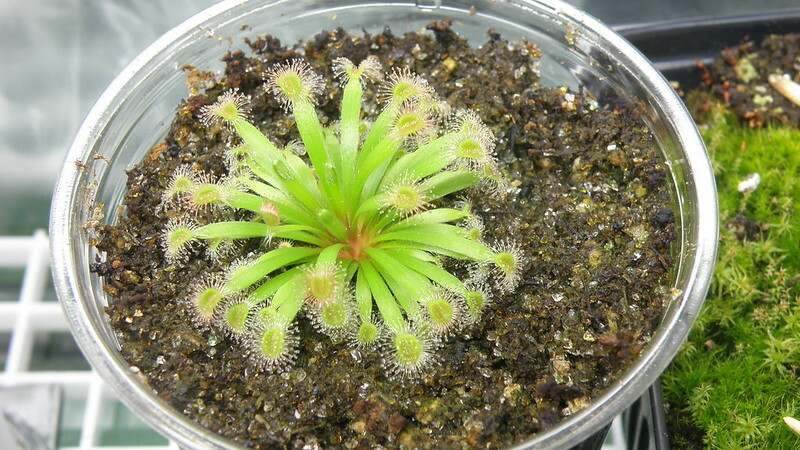 Drosera paradoxa grown by bluemax. SE How long have you been growing carnivores? BM Well, this is my third stint. I had a very unsuccessful run when I was a pre-teenager then began again when I was in my 20's and then 25 years later this session began. BM So about 4 years this last time. A lot has changed. SE In terms of hardware/technology? SE Or the plants that are available? BM When I was growing in the 70's there were only 3 species of Nepenthes I could get ahold of and I had better connections than most. SE What sort of plants do you grow? Is there a specific genus you focus on? BM I now focus on sundews but I grow a bit of many genera. BM I also grow utrics, pings, a few neps, drosos and Byblis. Oh, and sarrs. SE I'm also a sundew fan. BM Sundews are the coolest! SE I love how diverse the genus is. SE So many different adaptations to different conditions. BM Yes, they come in so many shapes and sizes. BM I'm also a big fan of the humble vft. SE How big is your collection, roughly? BM If I gave it in square footage it wouldn't amount to much, being a 55 gal and a 10 gal terrarium, and then some very large and smaller pots outside. SE I have 6 or 7 pots outside in a couple trays, and several trays inside under lights. SE How many species/clones do you have? BM I counted 29 a few months ago but I missed some and I have gathered a few more since then. It never ends. SE Hahahah of course not. BM One of the great things about Drosera is they mostly don't take up a lot of space. SE Absolutely, that's part of why I grow them. SE What are your growing environments like? BM The big terra is sub-tropical with moderately high humidity. The smaller 10 gal terra is the 'hot tank' that I grow petiolaris 'dews in. The out of doors is temperate with cool winters and moderate summers, and lots of rain. 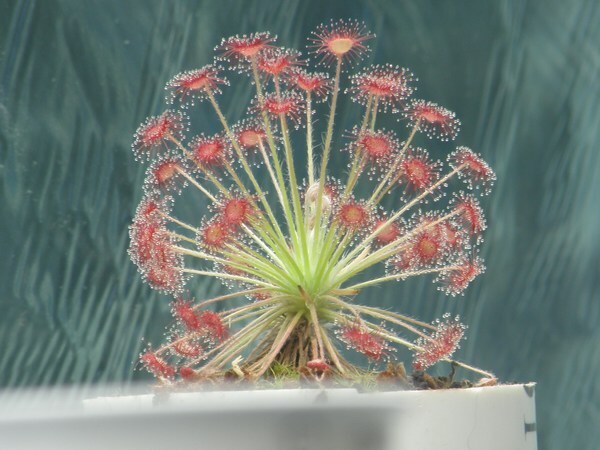 A variety of sundews growing in bluemax's larger terrarium. Apparently it's much more full these days. SE You live in the Pacific Northwest, right? BM Do you focus on any particular groups? SE I'm a sundew grower. BM S. African? S. American? US? SE I've got mostly subtropical species right now, but I'd very much like to start growing petiolaris 'dews soon. BM Petiolaris sundews are a rational project for any intermediate/advanced grower. SE I like Sarracenia because they're so striking, but I'll need to work out a less expensive water source if I want to expand my collection. BM That would be a limiting factor if I couldn't collect rain water as the sarrs do use a lot of it. SE I was just going to ask if you collected rain water. SE So you use that for all of your plants? BM Yes, I use rain water almost exclusively these days. SE Hahah that must be nice. SE How much time do you spend with your collection each week? BM Good question. I think it averages 3-6 hours. There's always something to repot and when that builds up the time I spend might increase. BM But I deal with them in some capacity pretty much daily. BM I'm always watching for some seeds or other to sprout out. SE What's your least favorite CP chore? SE I really dislike preparing media, but that's probably because I haven't developed a good system for it. BM Hmm. Mixing media can be a task. I really dislike dealing with pests, which fortunately hasn't happened this year. SE Yeah, I haven't had many problems with pests so far. What sort of pests do you get? BM Often in the fall when I bring plants in to winter indoors I will bring aphids with them. Also I sometimes have to deal with chewing pests in my bog pots outside. BM On the plus side I usually bring springtails indoors when I bring in plants. SE Springtails! My 'dews would love that. BM Springtails are easy to culture indoors and are the best for feeding 'dew seedlings. SE How do you deal with the aphids? BM I generally use Bayer 3-way as I find systemic insecticides are most effective. The stuff is very toxic and kills springtails too. SE You use T5 lights in your terraria, right? BM Yes. But if I were setting them up again I would probably use T8s as they are cheaper and easier to come by. The larger size isn't too much of a problem to me. SE Huh, that's good to know. SE I use T8s but have been thinking about using T5s on upcoming grow spaces. SE T5s are cheaper per lumen, but I don't spend too much on lights anyway. SE How long a photoperiod do your indoor plants get? BM For the subtropicals it varies from about 10 hours in winter to about 13 hours in summer. I like the plants to have seasonal changes. BM I often have problems getting rid of the heat produced by the T5s. SE That's good with the petiolaris dews though, I imagine. BM With the petiolaris tank the heat of the lights is fine as long as the cover glass doesn't get too warm. If it does it shrivels the leaves and tentacles of the plants. BM So I have to allow enough space from the lights to the glass. BM With a taller tank this wouldn't be an issue. SE Do you grow any pygmies? SE I was just wondering if the photoperiod changes result in gemmae production. BM All I have is scorpioides. I suspect someday I will grow others. BM When the photoperiod drops in the winter – that is when I adjust it – the scorps do produce gemmae. I would like to avoid that as they take months to recover. SE Speaking of lights and stuff, how much does your collection cost you per month? SE In terms of lighting bills, media, new plants, etc. BM I've never added it up. I buy media sporadically and I really don't run that many tubes. I mostly use peat and that is still only about $10 for a large bale of compressed material. SE That doesn't sound too expensive. BM The only time I feel the expense is when I am setting up a new large outdoor pot. SE Probably less than $40/mo, huh? BM I would think so. Also, if I am to replace old florescent tubes that can get expensive. I really need to do that soon. BM It would be interesting to do an entire year's expenses and see just what I spend. Drosera dilatato-petiolaris growing in bluemax's "hot tank." SE What do your family/friends think about your hobby? Are you in any CP societies? BM My family and friends view me as sufficiently eccentric that it is to be expected, I'm guessing. :p I do get complements, tho'. BM I am sort of a co-founder of the Portland Area CP meeting group. We do meetings every month at a local pub. It's a ton of fun. BM It happened very spontaneously after a few of us made some in person plant trades. SE Part of why I'm doing this interview series is to get more grower interaction. BM The reason I dropped out of growing cps the last time, in the 80's, was because I had no interaction with other growers. SE I know when I was first starting out it would have helped to be able to ask people questions about solving specific problems. SE Speaking of, do you mix/prepare your media in any special way? SE As I mentioned, that's my least favorite part of growing plants. BM I have variations for different genera/ species. My standard is peat with recycled glass sand and perlite. I wet the perlite down and just stir the ingredients together in a large enough container. If I am on top of it I put the resulting mix into a large screen collander and pour water through it to drain off dissolved impurities. BM You get less 'green slime' this way but it's not too intensive. For outside plants, which get top-water, I don't rinse at all. SE No really intensive washing, then. SE I have a hard time pouring water through my media, I think it's too heavy. SE My current bale of peat is very fine. BM Maybe if you used more sand or other added materials to break it up some? SE Yeah I'm going to try upping my sand ratio for my next batch. BM What are your favorite species right now? 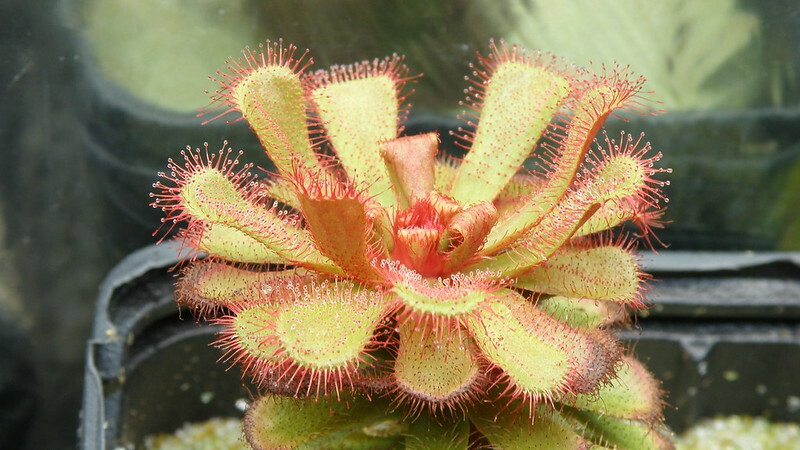 SE I love Drosera burmannii. SE I started some from seed back around Christmas, and they've grown so quickly. SE I also like pygmies, especially Drosera allantostigma. SE It's a really pretty sundew. BM I like burmanii, too. I am looking forward to trying sessilifolia. SE I'm trying to get my hands on some sessilifolia. BM Right now I am very focused on petiolaris sundews but that will surely shift. SE Any particular favorite in that group? BM I don't think so. When I go down the list I really like each species a lot. I am very fond of paradoxa especially. SE Are there any big goals for your collection in the next year or so? SE New grow spaces, plants to acquire, anything like that? BM I am still looking for the species I don't have of the petiolaris sundews. Overall tho' I am hoping to grow healthier/bigger plants in that time. I always find some challenges to deal with and I want to find solutions, ha! SE Yeah that's sort of how it goes. SE I'm going to either start a high-temp petiolaris tank or a cool highland setup soon. SE Depending on whether I decide to start with petiolaris 'dews or Orchidiodes utrics/S. American 'dews. BM Those are both cool and interesting projects. SE Can you think of any mistakes you made growing CPs that you've learned from? BM It is hard to focus in on one or two, ha! So many mistakes but lots of learning, I hope. SE What's your favorite part of collecting carnivorous plants? BM I think sharing experiences, images or conversation with others who also collect them. It multiplies the experience, which is pretty amazing even before. SE I like how active they are. SE They feel very alive and responsive, besides just being very interesting to look at. BM I agree. It adds to the aliveness a lot for me. SE I think it makes them especially fun to trade and discuss, because it feels like you meet a new personality whenever you get a new plant. BM Yes, a new species is a whole new world. BM Of favorite species I would like to add D. slackii. They never bloom for me but they get freakin' huge. Drosera slackii grown by bluemax. SE That's one of the winter-growing S. African species, right? BM More of a standard sub-tropical. Mine really do well when it is hitting 90 in the terra every day. They like a lot of humidity. SE I'll have to seek it out. SE Well thanks for sitting down for an interview! BM You bet. I enjoyed it as well.